This "Eared" Eden point was found sometime in the 1960's in Jackson County, Wisconsin and was on display for several years in a private museum. It represents one of the best examples of this point type ever found. 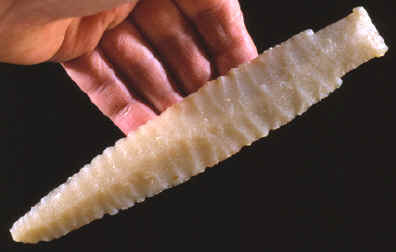 This point is made of Hixton silicified sandstone and measures 6 7/8 inches long. 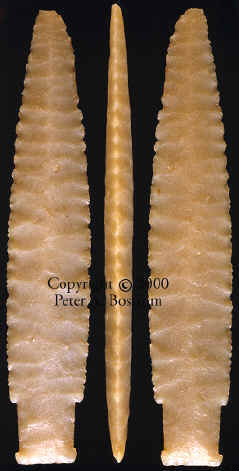 "Eared" Eden points were named and described in 1967 by Robert E. Ritzenthaler for examples found in Wisconsin. They are a rare variation of the "Classic" Eden points found in the western United States. An estimated date for this Late Paleo-Early Archaic lanceolate spear point is 8000 B.C. to 6000 B.C. Eden points were first found in Yuma County, Colorado blow-outs during the 1930's but none were found in situ until the spring of 1940 when Harold J. Cook spent several days digging on a site discovered by O. M. Finley. The Eden point type was named by H. M. Wormington after the town of Eden, Wyoming near where the type site is located. The Eden type site was named in honor of O. M. Finley who discovered the site (Wormington 1957: 124). Eden points are one component of the Cody Complex for which Irwin (1971) gives a time span of 7,000 to 6,500 B.C. and a geographical range of from southwest Texas to north west Wisconsin to eastern British Columbia. Eden points are famous for their exquisite workmanship. Though the Cody Complex is usually referred to as Paleo-Indian, available evidence indicates they were hunting the same animals in exactly the same manner as their descendants were until the introduction of the bow.